The opening bars of Marvin Gaye’s “Let’s Get It On” might have popped into Bryce Harper and Scott Boras’s heads when they heard the “stupid money” the Phillies were offering. Many Phillies fans might have had the same experience when they learned that the young superstar would be joining their favorite team. After the recent losing seasons, the fans have been “tryin to hold back this feeling for so long” and ultimately it is time for the team to “get it on” as they firmly move from rebuilding into their competitive window. And it would be easy to say that the Phillies’ signing of Bryce Harper was their primary accomplishment of the offseason. He’s an MVP winner and six -time all-star with a career OPS of .900, who many feel still has untapped potential at the age of 26. But it was the other acquisitions this winter (Jean Segura, Andrew McCutchen, JT Realmuto, and David Roberston) that will be the biggest difference makers as the team looks to make the playoffs for the first time since 2011. In Segura, the Phillies acquired a shortstop that has slashed .308 .353 .449 over the past three years with a yearly baseball reference WAR of 4.4. While Andrew McCutchen is no longer the MVP talent from his days on the other side of Pennsylvania, he has posted a well above average OPS+ of 120 in 2017 and 2018 with an impressive OBP of .366. Realmuto is regarded by many as the best catcher in the game and his offensive production should improve with his move away from Miami. While leading catchers in WAR last year, he posted an OPS 100 points higher away from Marlins Park. Finally, Robertson has been among baseball’s best relievers not named Kimbrel or Kenley, with a career ERA+ of 147 after a typically solid 2018. The Phillies finished 2018 with a record of 80-82 after being as many as 15 games over .500 in August. With their new additions and simply avoiding a late season collapse of 2018 proportions, the 2019 squad should be able to win 10 more games. What is the Phillies’ most recent accomplishment? It has been a two-season accomplishment: playing the offseason free agent and trade markets to build a playoff caliber team. How do the Phillies define success in 2019? The Phillies would call a postseason appearance this season a success. It’s been eight seasons since Ryan Howard blew out his Achilles to end the team’s last postseason game. The team is lined up to win now with their existing talent from 2018 and their offseason acquisitions. Despite the tough division, anything else would be a letdown and a bad way to start Harper’s 13-year tenure. Bryce Harper currently has 110 references on the Effectively Wild Wiki. That total is 36 ahead of Rich Hill, but fittingly well behind Mike Trout’s output of 366. 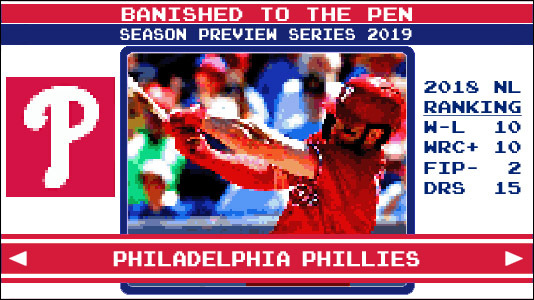 Perhaps that gap will narrow over the next 13 years (you heard it here first — 13 more years of Effectively Wild) as Harper tries to win Sam Miller his 50-home run season bet in hitter-friendly Citizens Bank Park. As a National, the Stormin’ Mormon had more roundtrippers in Philadelphia than any other road yard. The Phillies schedule is packed with promotional giveaways, activities (“Seniors Stroll the Bases” anyone?) and theme nights to keep the 100,000 fans who purchased tickets within hours of the Harper signing satisfied. While those fans are clearly excited about seeing the 2019 squad take the field, they will have not one, not two, but three opportunities to cheer on Phillies stars of the past. Retirement celebrations will be held individually for Jimmy Rollins (May 4), Chase Utley (June 21) and Ryan Howard (July 14).